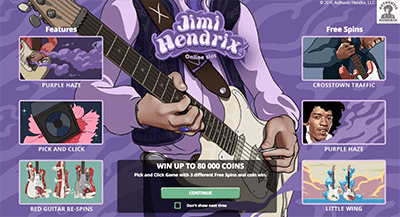 In a year when we’ve farewelled so many pop icons already, the Jimi Hendrix real money pokies game is a great addition to the online gambling scene. Let’s see how Net Entertainment has paid tribute to the man who changed the course of rock n’ roll with little more than a Fender Strat and a Marshall stack. You know you’re in for a good time when you load up a game and the first thing you hear is the intro to ‘Voodoo Chile’. Those unmistakable wah-wah strains set the tone for a pokie which celebrates what Jimi was all about: timeless tunes and revolutionary guitar playing. There are no great surprises about the layout or visuals of the main game. It’s a five-reel pokie with 20 fixed paylines, like many of NetEnt’s releases, laid over a trippy desert scene bringing to mind the artwork on Hendrix’s album covers. Connoisseurs of ’60s music culture might even say the cartoony nature of the design lends it something of a Beatles-ish quality. Compared to other licensed pokies games online, the Jimi Hendrix slot comes with very generous betting features. Players can choose from seven coin denominations (0.01, 0.02, 0.05, 0.10, 0.20, 0.50 and 1.00) and stake between one and 10 coins per line, which means you can bet anything from a $0.20 minimum up to a $200 maximum per spin. The symbol set combines standard royals (Aces, Kings, Queens, Jacks and 10s) with peace signs, love hearts and other motifs from the Flower Power era. The upper end of the scale focuses on the man himself and his weapon of choice, with a pair of unique Stratocaster symbols and a Jimi Hendrix wild. – Jimi Hendrix wilds substitute for any other symbol, except scatters. – Whenever the Purple Haze feature appears on the first reel, it transforms all royal symbols (A, K, Q, J, 10) into wilds for that spin. The Purple Haze icon also becomes a wild. – Four or more special Stratocaster symbols triggers the Red Guitar Respin feature. If another Red Guitar appears during the respin, a further respin is awarded. Respins only stop when new Red Guitars cease to appear. – Catch at least three Pick and Click scatters in any position to activate the bonus game, where you can win either free spins or a coin prize. Coin Prize – An instant cash win with a random multiplier between 8x and 30x. Crosstown Traffic Free Spins – Six free spins with wild reels that shift from reel to reel after each turn. Purple Haze Free Spins – Up to 12 free spins with Aces, Kings, Queens, Jacks and 10s all transformed into wilds. Little Wing Free Spins – Up to 12 free spins with overlay wilds appearing randomly on three, four, or five reels each turn. This game, like the great man himself, is all about the music. The visual themes might be simple and the animations somewhat cartoonish, but the soundtrack and in-game effects are right on the money. You can’t go wrong with authentic Hendrix tunes playing in the background, and the various guitar licks and vocal hooks for different line wins is a nice touch. It would be nice if there were a few more tunes besides ‘Foxxy Lady’ and ‘Voodoo Chile’ during the base game, but you do get to enjoy classics such as ‘Purple Haze’, ‘Crosstown Traffic’ and ‘Little Wing’ if you’re lucky enough to unlock the Jimi Hendrix bonus features. The gameplay is everything you would expect from Net Entertainment. The engine performs flawlessly, the audio-visuals are clean and rich, and the bonus rounds are both entertaining and rewarding. Payouts fall into the low-medium variance bracket, which is ideal for the average punter, but a $200 bet limit provides plenty of scope for high-stakes pokies players. You can play Jimi Hendrix slots online at several of our top-ranked instant play casinos for Australians. Our favourite online casinos hosting NetEnt pokies are listed in the casino table at the top of this page, which has been geo-targeted to only recommend safe, licensed casino sites that accept players from your country, no matter where in the world you’re playing from. Gameplay at each of these sites is available in instant-play mode, which means you can play directly over your Web browser without having to download any additional software. 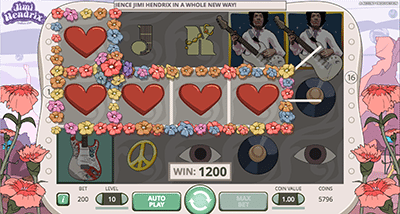 The Jimi Hendrix pokies game is also available for mobile play at these mobile casinos, compatible with all data-enabled smartphones and tablets. Sign up to play Jimi Hendrix at Emu Casino and receive a matched deposit bonus up to $300 when depositing real money for the first time.